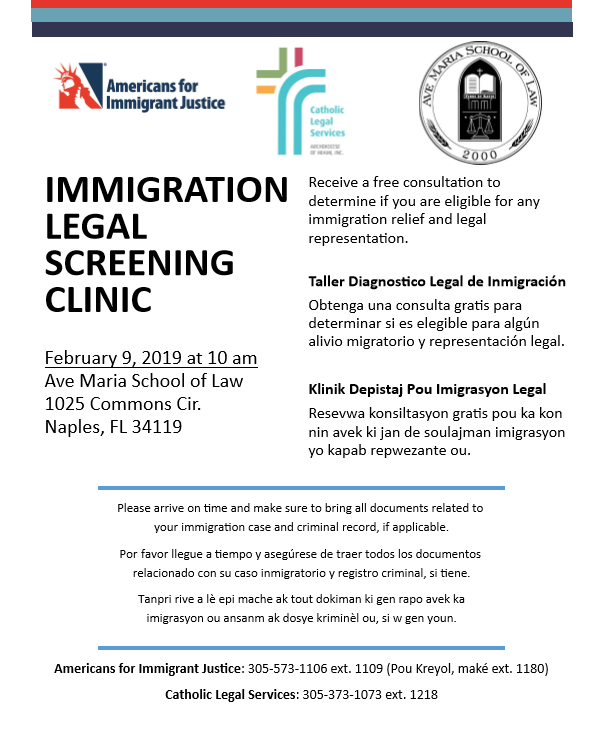 For the second year in a row, the Ave Maria School of Law is partnering with non profit legal service organizations to host an immigration screening clinic at its Naples campus. More than 20 volunteer attorneys and law students will provide free one-on-one consultations in English, Spanish and Creole. Jacqueline Coronel is a second-year law student at Ave Maria and is helping coordinate the event. Coronel urged anyone with questions regarding their legal status in the U.S. to visit the immigration clinic and to bring all the documents they may have. The clinic will be begin at 10 am on Saturday, February 9th at the Ave Maria School of Law. Coronel said the consultations will be given throughout the day until every person has been seen.